I want to explain here to you how the arrival of the ants is not just a natural phenomenon. I want to discuss how it emerges from the local economy of housework, from the South African system of cheap domestic labor. And its antediluvian structures of race and gender. I want to say something about how those who purchase domestic labor may prefer to leave certain kinds of work, like dishwashing, for those who are paid to complete it. And about how that may inadvertently provide the ants with a food source. But it’s hard for me to write here in detail about my household economy. There’s a lot that’s hard to talk about in this social context. Not that anyone tells you not to speak about it. They don’t need to. The economy of domestic labor in South Africa — as in southern California — is completely visible but barely spoken about. Hidden in plain sight, the eye can take it in, but the tongue should be still. 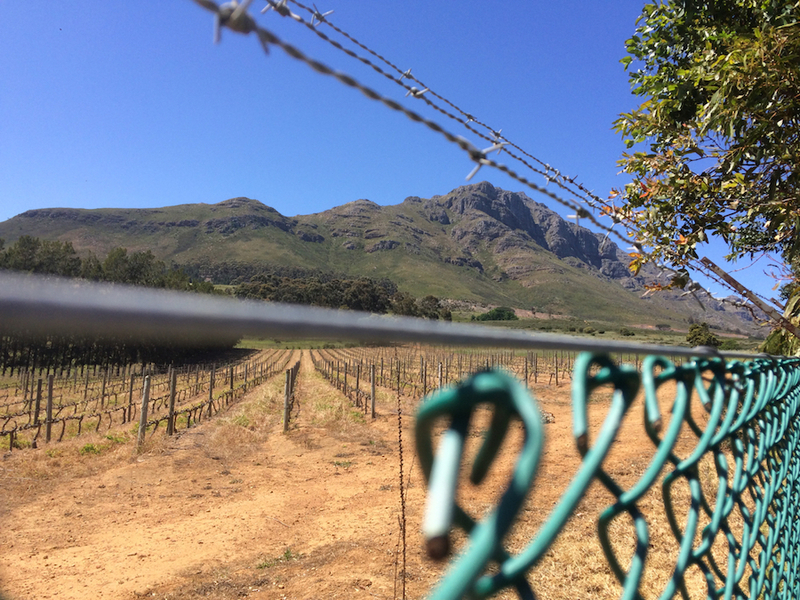 It was hard for me to find a place to stay when I first got to Stellenbosch. So I was happy to find a little apartment. It’s in the basement of a big house overlooking the city. At night the city lights twinkle down in the valley. Proximity to the mountain is of course a form of class symbolism. The neighborhood, Bo Dalsig, is one of the wealthiest in the country. All the houses have huge gates and security systems. The residents come and go in expensive cars. On weekday mornings, the domestic and yard workers climb the hill on foot. At first, I walked to work. It took about 25 minutes. Then I bought a bike and it took 10. Then last week, my colleague lent me his spare car, which isn’t any faster than biking to get to work, but makes it much easier to come home with the groceries. It’s the day before classes start, and I’m teaching a medium-sized lecture class about how to do ethnography. I’ve taught this topic before, a few years ago in Chicago, but this year I rewrote the syllabus to focus much more on analyzing ethnographic situations. The lectures are organized around a series of basic concepts: situations, projects, culture, ideology, representation, contradiction, practice, strategy, conflict, reflexivity, that sort of thing. Meanwhile the students will be doing fieldwork each week and talking about that in discussion sections. Here they’re called tutorials. I’m looking forward to teaching, in spite of some minor anxiety about the first day of class. You never know quite what will happen in a class; you just know you’re physically invested in the outcome. Before I was a teacher, I didn’t realize how much one has to invest in the role and the ensuing performance. I’ve never been a stage actor, but I think of teaching as a cousin of acting. One time an eminent, retired woman academic told me that she still got anxious before giving conference talks. And if you stop getting anxious, that’s a problem, she added. The same for teaching, perhaps. I’ve never had much stage fright, so for me, the anxiety is more a source of energy than of paralysis. Of course, the economy of teaching remains hard to write about publicly, especially in the present (i.e. not in hindsight), because there’s so much that goes into maintaining role separation between teachers and students, so much backstage work on both sides. And because the class and gender and race lines in many university systems are real, and remain very fraught. Not entirely unlike in the domestic work context. But I’ll have to come back to this. It’s the day before the first class, so in the spirit of seriousness, I will go into my office on a Sunday morning and write my lecture. The first day of class, you end up spending half the time explaining the logistics anyway. There’s domestic labor in the classroom too: neatening things, making organization, clearing up cobwebs.